When it comes to creating a safe work environment and maintaining compliance with OSHA regulations, we offer a wide scope of safety training courses including CPR, Excavation, Fall Protection, and Forklift operation. Our training sessions are designed to engage your staff to maximize their absorption of the information covered. Classes are available on or off-site and can be scheduled around your employees' availability. A well trained workforce is a safe one. To learn more or to schedule, call (800) 941-0714. Download our Safety Training Catalog for a full list of courses and pricing. For organizations that have time restraints or geographic challenges to assemble work crews, SafetyPro offers OSHA training courses online. SafetyPro Resources offers Process Hazards Analysis facilitator training for organizations regulated by OSHA's Process Safety Management standard. 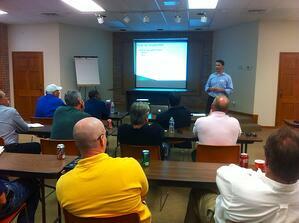 We offer a variety of safety courses that can be taught at our training facility in Baton Rouge or at your site. Fire Prevention: A 1-hour course that provides basic information about how fires start and how to prevent and extinguish various types of fires. The course covers fire prevention, fire warning labels and various extinguishing systems. HAZWOPER 40 Hour Course: A 40-hour course that is designed for individuals who respond to releases or potential releases for the purpose of stopping the release. They will assume a more aggressive role than a first responder at the operations level in that they will approach the point of release in order to take necessary measures to stop and control the release. Attendees will also engage in hands-on-clean-up operations. Lock Out/Tag Out: A 2-hour course that covers OSHA’s Standard CFR 1910.147 regarding the control of hazardous energy and identifies safe work practices that are required for all employers in general industry. Supervisor Safety Training Workshop: An 8-hour workshop designed for individuals looking to strengthen their supervisory safety skills. These individuals will learn effective communication and leadership skills; supervisor/team leader's roles in the management process; hazard recognition, evaluation and control; and an introduction to incident investigation and RCA.